AM145 – Large estate with 2 independent houses. On the outskirts of the municipality of Alora, close to Cartama Estacion, is this large estate of 60,000 m2. On this estate there are 2 houses, large garage, wine cellar (also for the olive oil) to make your own Rioja / tempranilla. The large main house has 3 bedrooms and 3 bathrooms, the master bedroom has a beautiful ensuite bathroom. There is a fully equipped kitchen and storage / laundry room with a large dining room. A small level lower there is a very large living room with an office attached to it. This office can possibly be converted into a spacious bedroom with ensuite bathroom. Outside is a large carport for several cars. On site is also a large garage with also the central heating system that is operated via solar panels or with boiler as backup. There are 2 fireplaces present which also heat the central heating system in the winter. All rooms also have air conditioning w / k.
Outside there is a covered BBQ area with an old bread oven. Here is also a shower and toilet to use for the outdoor pool of 12×6 which is located next door. There is also a large sun terrace with a large pond. A little further there is a special paved area for sport such as football, basketball and tennis. Under this sports field there is a bodega for making your own wine and olive oil. There is also a large garage for the agricultural machinery and an emergency system that automatically switches on when the electricity fails. Through a completely different entrance is the 2nd house that is currently used for rental. This house has 2 bedrooms and 2 bathrooms. There is a fully equipped kitchen, dining room, living room and an indoor swimming pool. Here too, a covered BBQ area with heating and air conditioning. The house is equipped with a central hot air heating that can be set per room. There is also a fireplace in the living room. On this house is a roof terrace with very nice views. 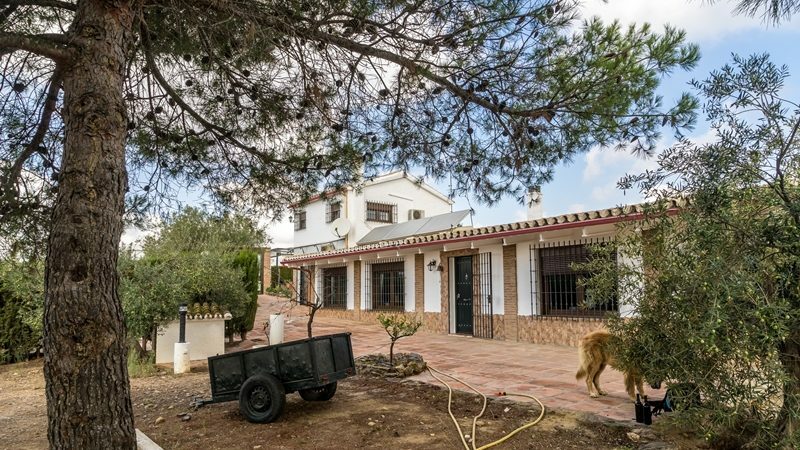 This property stands on a fenced plot of 2000 m2 with various fruit trees. Both houses are equipped with a camera / alarm system. Hot water is via solar panels and from 2 private water sources. All doors and garage doors can be operated electrically. there is an irrigation system on the property and various points have been made over the land in order to extinguish a fire. ← AM145 – Large estate with 2 independent houses.